SCHUYLER COUNTY—About 100 people from the Civil Service Employee Association (CSEA) Schuyler County Administrative unit came to protest, at the Schuyler County Legislature regular meeting Monday, Nov. 9. The protesters urged the legislatures to reconsider the tentative 2010 budget which would cause staff reductions by 12.5 full-time equivalents. The protesters stated the layoffs would hinder the services provided to the county. Without certain staff members, aid would not be available to some of the most vulnerable people in the county, such as homebound clients. With these layoffs the stress and caseloads would continue to pile up on current staff members, decreasing the services that should be available to people in the county. They also stated that layoffs would not only affect co-workers, but those in other offices and areas as well. The protesters asked that the legislators find other areas in the budget to make cuts or changes. “You do not have to do it alone. We are more than willing to work with any county leader,” Colleen Wheaton, region five president of the CSEA said. One of these areas in which cuts could be made include reinstating the 4 percent sales tax on clothing. Protesters stated that all of the people, who came with the CSEA, including tax payers and business owners, are willing to pay the sales tax in order to keep these services available and avoid the layoffs. The board had mixed concerns about this proposal. Legislator Delmar F. Bleiler Jr. stated his concern that the government will most likely reinstate the sales tax in the future anyway, and then money would have to be found for new cuts. More cuts are expected in this year’s budget, and the 2011 budget is predicted to be even worse. “I just don’t think we can afford to do it,” Bleiler said. Legislator Glenn R. Larison agreed with Bleiler, stating that the government will put the sales tax back on next year. He also added that people from out of the county are coming to shop at stores, which brings money into the county, and with the added sales tax on clothing some of those people wouldn’t travel to the county and bring the money in. Legislator Paul N. Marcellus said that by signing a sales tax increase it automatically assumes that the county will gain ground, but it’s not guaranteed. He has been seeking other avenues and alternatives in the budget. “Answers can be found other ways than in reenacting a sales tax,” Marcellus said. Legislator Dennis A. Fagan agrees with the protesters saying that the 4 percent sales tax could reduce the number of layoffs required. He would like to see an improved morale and provide efficient continued services to people in the county, and then look at staff cuts later. Fagan also argued that more people should have forgone their pay increase, which would have provided more money, and possibly avoiding the current layoffs. “A little bit of pain from all is better than excruciating pain from a few,” Fagan said. County Administrator Tim O’Hearn gave an overview of the proposed budget, including facts and figures from previous years, allowing the protesters to gain a better understanding of why the layoffs have been proposed. He said that reenacting the 4 percent sales tax could restore some positions from being laid off. Reenacting the sales tax would bring in about $150,000, which could save about four jobs. The cost of the total number of layoffs is over $400,000. “It does not restore all positions by any means,” O’Hearn said. The board tabled the proposed budget in question, allowing more time to look into the budget and possibly avoid the layoffs. 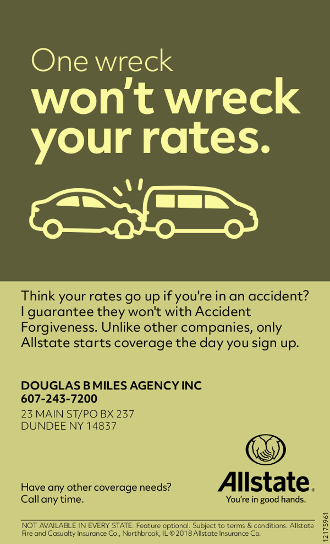 This will also allow more time to see what the state does about the current economic situation. The board will readdress the 2010 budget Dec. 9, following the Legislative Resolution Review. 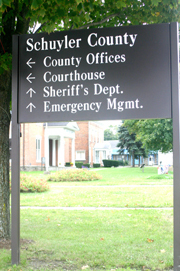 The next regular meeting of the Schuyler County Legislature will take place Dec. 14.